My three year-old is into all things fancy. 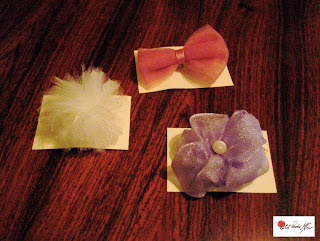 So, I dug through my scrap stash and whipped up these fancy hair clips for her. The pink one is (of course) her favorite. It is tulle with a satin band for contrast. The white one is a tulle pom pon. The purple one is an improvised flower with a pearly found button. These are the first hair clips that she's actually worn consistently.